Lock in a great price for Bed and Breakfast Villa Klaic – rated 9.4 by recent guests! The owner is very friendly, helpful. He is everything. Room is clean. Location is not far from the city. The excellence of the property is only exceeded by the warmth and graciousness of Milo and his family. Dubrovnik is wonderful, but they are what made our visit truly memorable. Milo and his family make you feel like you are at home from the minute you arrive. Everything from the breakfast in the morning to a wind down beer in the evening was done with care and class. We stayed for three days and by the time we were to take off to our next destination I felt a little sad like I was leaving an age old friend behind. Thankfully, this was the first place we visited on our two week vacation because the information, the travelling tips and the general kindness put us in a position to truly enjoy our vacation. Thank you Milo and the Klaic family. Živjeli! Great location, value, and service. Of course, the beer too! Great place! Wonderful and very helpful hosts. They even threw a party on one of the evenings for the guests with lots of drinks, food and live music! Our room could have been a bit bigger, but breakfast was inadequate (eggs and some pastries would have been nice). Overall, good stay! The view was incredible, as were the hosts, the breakfasts, and the happy hour. The facility was clean, the view was great, and the host was very knowledgeable and kind. Can't as for much more then that! We had a room with a little kitchenette and terrace, and it was charming. It's located up the hill from town, so you should plan on walking; it's a great way to see town. We also had an opportunity to meet other guests, which we enjoy. Milo was able to provide a ride from the airport, and he also had beer available which we appreciated. Milo provided some recommendations for sights and restaurants, and breakfast was great too. We had a perfect stay here. Offering a sun terrace with a small outdoor pool, Bed and Breakfast Villa Klaic is located 0.6 mi from the Old Town of Dubrovnik. Free WiFi is available. The spacious, air-conditioned rooms come with a flat-screen TV and a private bathroom. 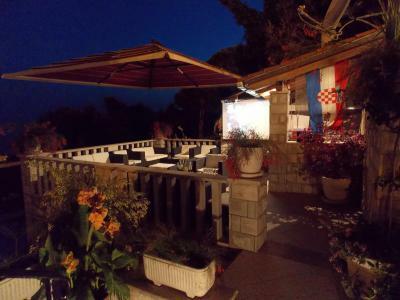 뀐 Located in the top-rated area in Dubrovnik, this property has an excellent location score of 8.5! When would you like to stay at Bed and Breakfast Villa Klaic? This studio has a balcony, kitchenware and private entrance. This double room features air conditioning, sea view and private entrance. House Rules Bed and Breakfast Villa Klaic takes special requests – add in the next step! The parking, you have to park on the street, then walk across the street to the guesthouse. Fortunately rhey have a very strong owner who can carry our luggage across the street, and the owner help to reserve a parking spot for us. Should have two blanket in each room. The pool was too cold to swim in. All the steps up and down into town - keeps you fit though! Great welcome; nice room; good breakfast. Mosquitoes, but that’s not the hotels fault. A lot of climbing uphill from the town in the heat. Friendly owner, Milo, made us feel really welcome. Comfortable room and a good breakfast. Nice patio area to relax and drink a free beer or two. Swimming pool was a good way to cool off after the walk up from the town. Glad we organised the transfer to and from the airport with the hotel as it took away any pressure. I would stay here again when in Dubrovnik. Host was great. Friendly family and area. The fabulous host Milo! He and his family make sure everything is taken care of! This was our second stay at Villa Klaic, having previously stayed in 2012, and we wouldn't think of staying anywhere else in Dubrovnik. We LOVE Milo and his family who run the villa - nothing is too much effort and the place is so clean and comfortable. We will definitely be back again. I never usually write reviews but from the moment we arrived at villa klaic the owner Milo greeted us with a big smile and instantly made us feel at home. He took our luggage and got us comfortable and offered us a drink. 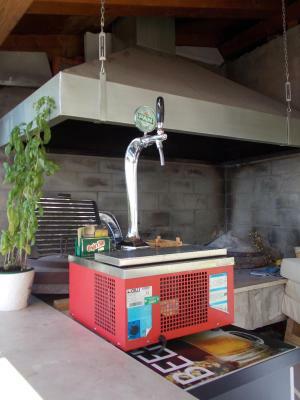 He has a beer pump on the sun terrace which he welcomes guests to help themselves to free of charge during their stay. He talked to us for over an hour and then settled us into our room. The rooms are very comfortable and modern. The showers are hi tech and very powerful. The beds are very comfortable. The pool area is lovely with views over Dubrovnik. The breakfast is lovely and all of the guests that we're staying were lovely and we all sat by pool during the day and on the terrace on a night. Milo always makes an effort to sit with you and ask about your day. Home away from home. Definitely recommend. The hotel is up a fair few steps from the old town but well worth it for the views and all hotels seem to be up steps. Would not stay anywhere else! Big thanks to milo for making our holiday!